At Mobile World Congress earlier this year, in Samsung's absence, an opportunity lay in waiting for any manufacturer that unveiled a noteworthy flagship phone. With Huawei, LG and Sony vying for the spot, it was the latter that seemed to make the biggest impression with its Xperia XZ Premium, even scooping the prize for best smartphone at MWC 17. Now the flagship has landed in South Africa, bringing with it a 4K HDR-capable display and 19 MP camera that touts a 960 fps slow-mo mode. Added to this is Qualcomm's much-lauded Snapdragon 835 CPU and its Gigabit LTE, which also makes the XZ Premium the first mobile device locally to do so. With so much going for the Xperia XZ Premium, can it deliver on the promise of being the best flagship phone of 2017, which it showed in Barcelona? For a number of years now, Sony has had a specific aesthetic when it comes to the Xperia devices. The same goes for the XZ Premium, which looks like a larger version of the XZ that the Japanese manufacturer debuted last year. To that end, the phone has a fairly blocky frame to it, with curved edges on either side, and a flat back cover. As far as designs go, the XZ Premium isn't exactly the most dramatic looking flagship around, unlike say the Galaxy S8. This latest offering from Sony is perhaps better placed in the category of a phone like the LG G6 or Huawei P10, as a device that emphasises features and specs over looks. Shifting to the user interface, it's also much the same from Sony. 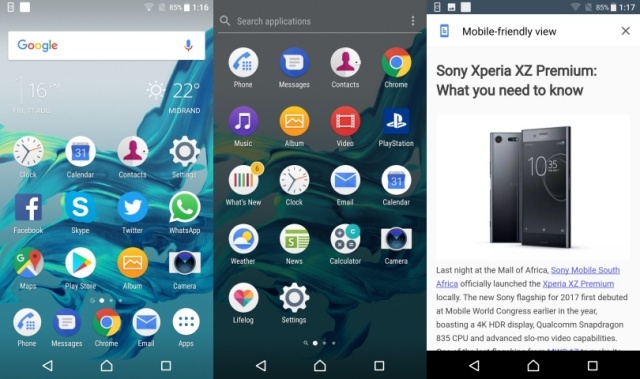 To that end, the Android Nougat (7.1) operating system on offer is layered underneath Xperia's usual UI. Whereas some manufacturers have opted for a cleaner OS, even going the pure Android route, others like Sony and Samsung prefer to feature their own take. Consequently, the XZ Premium does feature a few surplus apps and some duplication. It's not quite bloatware, but is a little more cluttered than one may be hoping for. While the UI and design may not be much to write home about, the XZ Premium's other elements certainly are. First up is the display, a 5.46" IPS LCD screen with a 3840x2160 resolution and substantial 807 ppi pixel density. Just like the LG G6, the XZ Premium caters to HDR10 content, which means it can handle some of the most visually demanding videos, movies and games around. As such, for users who will be digesting plenty of content, the XZ Premium comes well equipped. Added to the HDR10 is 4K functionality, which was introduced on the Xperia range with the Z5 Premium. The ubiquity of 4K content, particularly on mobile, still remains an issue, but unlike the Z5 Premium, the XZ Premium is about more than just its display. This brings us to one of the phone's unseen, but equally notable features - its processor. In that regard, Sony has opted for a Qualcomm Snapdragon 835 CPU that has eight cores and registers a combined total clock speed of 4.35 GHz. Added to that is 4 GB of RAM and 64 GB of onboard storage (microSD slot for up to 256 GB). Image taken with the Sony Xperia XZ Premium. The result is the best benchmark scores we've recorded to date. On AnTuTu (v6.2.7) it got 179 449, which is better than the Galaxy S8's 168 990 and LG G6's 137 637. Not just impressive in testing, the XZ Premium is equally adept in actual-use, with multitasking and switching between apps a breeze. The only time the XZ Premium shows any signs of lag is with the fingerprint reader (located on the right-hand side), taking a good deal of time to unlock the device or bringing up a black screen when it does. Finally worth mentioning is the XZ Premium's party piece - the camera. As a primary shooter, the new 19 MP MotionEye lens onboard performs ably, producing beautiful images outdoors or in low light. One of the main aspects of note though is the slow-mo, which Sony has refined to deliver up to 960 fps. It's an intriguing feature, and one that's a good deal of fun to play around on and experiment with. We don't think it is the sole reason for buying the XZ Premium, however, but rather a cool feature to show off to others. Armed with a great display, feature-rich camera and powerful processor, the XZ Premium should be hands-down the best smartphone around at the moment right? Well, not quite. For some reason we're not able to fully pin down, there's a piece missing from the equation. Compared to the Galaxy S8, which is the best phone currently available in our opinion, the XZ Premium doesn't feel like the complete package. It could be its bland design, cluttered UI or a combination of both, but this latest offering from Sony falls just shy of greatness as far as we're concerned. That said, there's still a lot on offer with this supremely well specced device at R14 999, showing that Sony have made one of the best phones of 2017, just not the very best in our books.